While Chromebooks have long dominated in the education space, they are now making inroads into other industries as more organizations shift away from traditional desktop computers to portable and low-cost thin client devices. These Chrome OS-powered devices offer a similar look and feel to laptops, except instead of storing files locally of the device, everything is in the cloud—software is run in the form of cloud-based apps, and files are stored and shared in Google Drive. In 2013, Chromebooks accounted for just 1 percent of all PCs sold. Over the past five years, that number has risen to 6 percent, with the expectation that it will reach 8 percent by 2021. For comparison, macOS accounted for 8 percent of sales in 2017. One industry that’s experiencing this growth in adoption firsthand is healthcare. More and more, healthcare providers are moving away from workstations in favor of virtual desktop infrastructure (VDI) thin client solutions. And of the available thin client hardware options, Chrome devices in particular offer unique benefits to healthcare providers. Hospitals are under increasing pressure to reduce costs, while providing higher quality care. As a result, they are always looking for ways to streamline operations and increase clinician productivity. Enter Chrome devices. Chromebooks offer speed, security, and simplicity of deployment and management—all of which appeal to hospitals looking for new IT solutions that boost efficiency and lower TCO. Chrome OS enable healthcare organizations to accomplish cloud-based data sharing, while providing a centralized platform for secure management and implementation and easy access for clinicians. Google Cloud provides healthcare organizations with a truly connected infrastructure. This, combined with the portability of Chrome devices, makes it possible for clinicians to access their work on the go and from virtually anywhere. Furthermore, Chrome devices can be securely shared by multiple users through encrypted cloud profiles, allowing clinicians to access their work across multiple, shared devices throughout a hospital. This saves time and enables clinicians to work more efficiently. For example, a clinician wouldn’t have to waste time running back to her office or a dedicated computer to log or look up patient information. Chromebooks also enable clinicians to get to work quicker. Because files aren’t stored locally, boot times are drastically reduced compared to traditional laptops and desktops. Compared to desktop computers and laptops, Chrome devices are significantly less expensive (typically, around $300). In today’s healthcare world, a less-expensive Chrome device can be just as effective as a desktop/laptop setup due to the fact that applications are increasingly web-based. 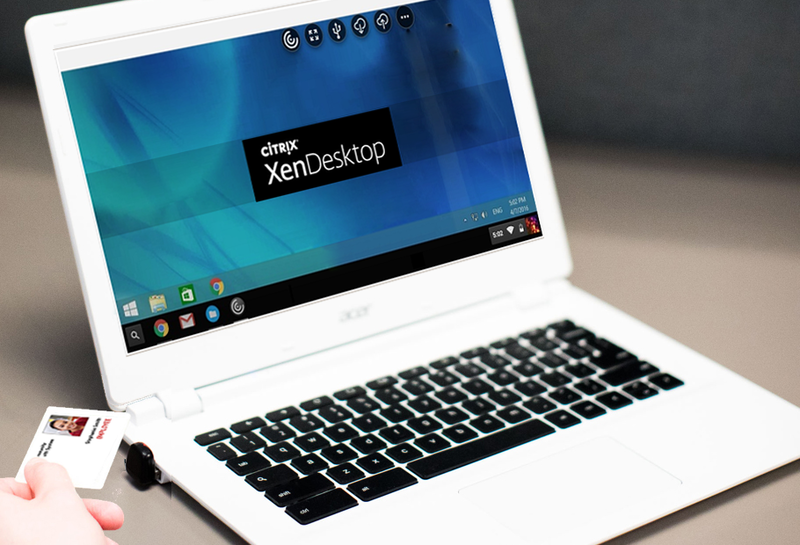 Moreover, if healthcare organizations are utilizing VDI’s, such as Citrix XenApp and XenDesktop, Chrome devices provide access to even more applications within those virtual sessions. Chrome devices utilize Google's innovative Chrome OS, which incorporates built-in security at every-level and automatic updates. Plus, all Chrome devices on a hospital’s network are managed from a single Google Admin Console, allowing Administrators to centrally manage all IT tasks and security policies. Physical theft of laptops, especially from victims’ vehicles, is a particular risk in healthcare. In fact, equipment theft accounts for over 16 percent of security incidents within the industry. Because Chrome devices store all information in the cloud, this eliminates the risk of sensitive information being accessed through stolen equipment. Even in the event that clinician credentials have also been stolen, Chrome devices can be remotely wiped, turned off, and restricted to certain users to further strengthen device security and overall cybersecurity. When it comes to getting the most out of your Chrome device implementation, your proximity badge solution (or lack thereof) is likely holding your organization back. You see, most proximity badge access solutions don’t support Chrome devices. Clinician productivity starts with the ease of access. So, if clinicians are being bogged down by slow login processes, like manually re-typing passwords multiple times throughout their shifts, this can quickly erode the efficiency advantages Chrome devices provide. On the other hand, a best-in-class proximity badge access solution can actually amplify the efficiency and security benefits of Chrome devices. QwickAccess for Chrome devices brings HealthCast, Google, and Citrix together to offer healthcare organizations the only proximity badge access solution available on Chrome devices. QwickAccess was purpose-built to streamline ease of access and clinician workflows, while reducing costs and complexity. When paired with Chrome devices, QwickAccess enables Citrix users to access their missions-critical applications with the simple tap of a proximity badge. Here’s how it works: a clinician simply taps his or her badge on the proximity badge reader to “tap-in” on a workstation. Then, the user taps the badge a second time to secure his or her session. QwickAccess also offers unique tap-over functionality that allows a user to access his or her work on a device that’s already being used by securing the previous user session for access at a later time, while simultaneously logging the new user in. QwickAccess furthers increases user convenience and mobility by enabling users to easily roam their sessions from one Chrome device to another. QwickAccess also supports mixed device environments, allowing users to roam their sessions between different types of endpoint devices (HP, Dell Wyse, etc.). So for example, a clinician can tap-out of their Chrome device in one department and pick-up right where they left off on an HP Thin Client in another part of the building. On top of efficiency increases, QwickAccess helps healthcare organizations strengthen security and HIPAA compliance by making it quicker and easier to secure sessions. Configurations can even be made to automatically log clinicians out after a predetermined amount of time if they forget to do so themselves—further preventing sensitive information from falling into the wrong hands. Chrome devices provide versatility and ease of device management—benefits that can’t be fully realized if your proximity badge solution doesn’t support them. When Chrome devices are paired with QwickAccess, organizations get a more cost-effective and powerful combination that increases productivity, enhances organizational security, and simplifies device management. To learn more about QwickAccess and the benefits it offers to hospitals and healthcare providers, download our QwickAccess product guide. Learn about the benefits of Proximity Badge Technology in Healthcare and key features to look for when selecting a solution.